Megane – Hazushitemo Ii desu ka? English: May I take your glasses off? Synonyms: Megane ~ Hazushitemo Iidesuka? 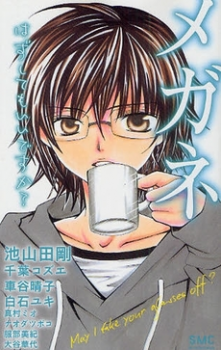 Summary: A collection of short stories of girls who lurve their megane boys~! High school girl Chihiro is, in fact, a shounen manga author! She bases her manga on her wild ideas with her first boyfriend, Izumi-kun, but she’s keeping it a secret from him…? Chisako has a boyfriend that’s the head of the public morals committee but she has a secret that he must not find out! When Sakurai came early to class one day, she starts talking to guy who wears glasses in her class who also came in early. Bored by his responses, she decides to steal his glasses revealing this four-eyes is actually quite a bishie!